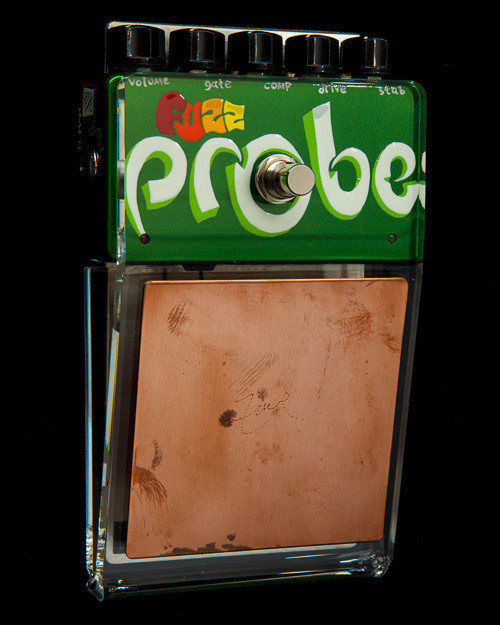 The Fuzz Probe is a kind of cross between a theremin and a fuzz factory. 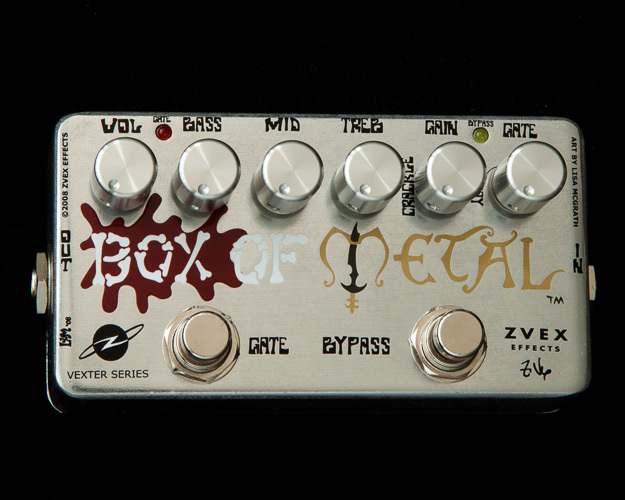 The Fuzz Probe is a kind of cross between a theremin and a fuzz factory. 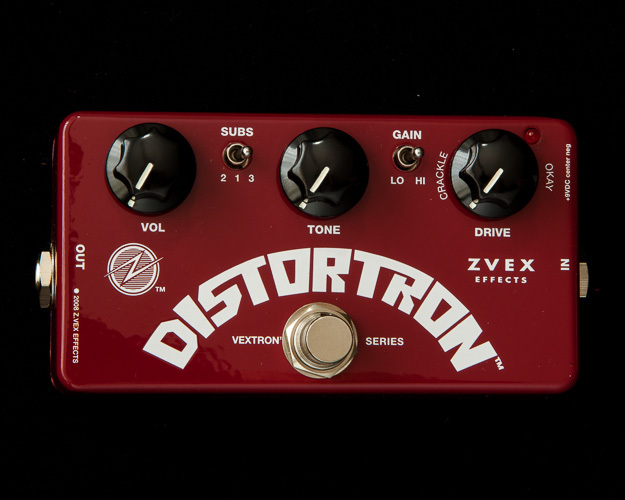 There is a 3 5/8″ copper plate mounted on a chunk of 3/8″ clear acrylic that passes over the top of the pedal housing, angles down to sharp turn, and goes back to the pedal. Under the whole mess is a 3 5/8″ by 7″ sheet of aluminum that provides shielding from annoying ground effects and wires under the stage. 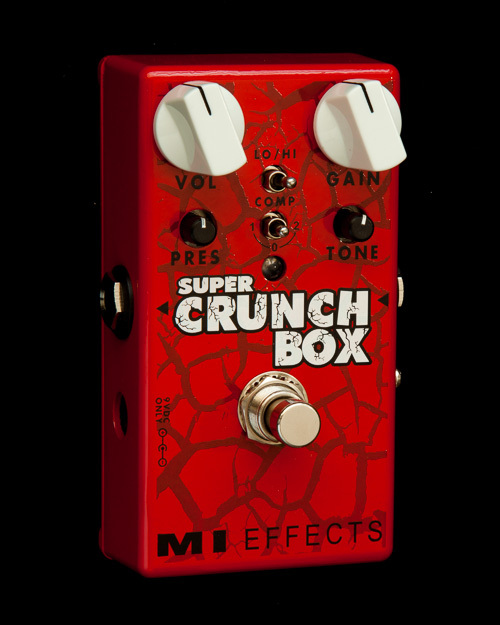 It also serves to protect the knobs from being knocked off if you drop it on them… and it makes a nice toe chopper if you are barefoot, so (legal disclaimer:) DO NOT DROP THIS PEDAL ON YOUR FOOT! IT IS HEAVY AND HAS VERY POINTY CORNERS THAT COULD DAMAGE LIVING CREATURES AND FINE HARDWOOD FLOORING. ALSO, YOU COULD BREAK SOMETHING. Like your dog. Already, it should be apparent that this is the most dangerous pedal I have ever made. Ow! The copper antenna projects a field of RF energy that is affected by your foot (or other appendage), altering the circuit that generates it, and in so doing, increasing the brightness of that LED on the top of the pedal and also controlling the STABILITY (STAB) knob on the back. I could have made it just control that LED, I mean, that’s enough for some people, but nooo, I went and connected it to the stability knob too. 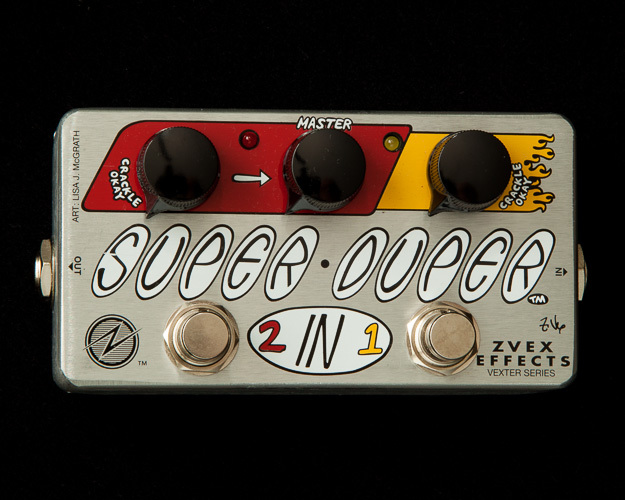 This lets you select your favorite squealy fuzz factory setting (doesn’t the band love that?) and then mess around with the STAB knob with your foot and create little melodies and interference modulations with your guitar (doesn’t the band love that even more?). Let’s say you set the knobs (face them straight on to do this) to vol=9 o’clock, gate=7 o’clock, comp=10 o’clock, drive=noon, and stab=7 o’clock. By the way, to get the widest range for the probe control, be sure to leave the stab knob on 7 o’clock. THE PROBE ADJUSTS THE STAB KNOB FROM WHEREVER IT IS SET, UPWARDS TOWARD THE MOST CLOCKWISE POSITION AS YOU GET CLOSER TO THE ANTENNA. It you set the stab knob more clockwise, say, to select a favorite pitch to start from, the probe will let you raise that pitch up to the top as you get closer. If you put the stab knob at the top, at 5 o’clock, all the way up, the probe will do NOTHING. That’s cause it is made to adjust that knob from WHEREVER IT IS SET to the TOP, and if it is already at the top, then no adjustment takes place. Get it? No? Well, just set the STAB somewhere lower than all the way up, preferably all the way down, and don’t bug me about it.